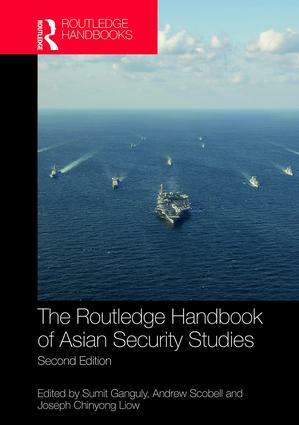 The Routledge Handbook of Asian Security Studies provides a detailed exploration of security dynamics in the three distinct subregions that comprise Asia, and also bridges the study of these regions by exploring the geopolitical links between each of them. This fully revised and updated second edition addresses the significant developments which have taken place in Asia since the first edition appeared in 2009. It examines these developments at both regional and national levels, including the conflict surrounding the South China Sea, the long-standing Sino-Indian border dispute, and Pakistan’s investment in tactical nuclear weapons, amongst many others. This book will be of great interest to students of Asian politics, security studies, war and conflict studies, foreign policy and international relations generally. Sumit Ganguly is Professor of Political Science and holds the Rabindranath Tagore Chair in Indian Cultures and Civilizations at Indiana University, USA, and a Senior Fellow at the Foreign Policy Research Institute in Philadelphia. His most recent publication is Ascending India and Its State Capacity (with William R. Thompson, 2017). Andrew Scobell is Senior Political Scientist at the RAND Corporation and Adjunct Professor of Asian Studies at Georgetown University’s Edmund A. Walsh School of Foreign Service, USA. His most recent publication is PLA Influence on China's National Security Policymaking (2015). Joseph Chinyong Liow is Dean and Professor of Comparative and International Politics at the S. Rajaratnam School of International Studies, Nanyang Technological University, Singapore. His most recent publication is Religion and Nationalism in Southeast Asia (2016).